Ann Arbor District Library board meeting (Nov. 22, 2011): After pausing a project to redevelop the library’s downtown building three years ago, the AADL board voted at their November meeting to provide funds for consultants to help resume the process. A transfer of $45,000 from the library’s fund balance to the administration’s consulting budget will be used to start the process for determining the future of the AADL’s downtown location, director Josie Parker told the board. 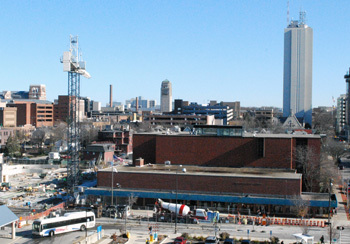 In late 2008, economic conditions had prompted the board to call off plans to construct a new downtown building – a process that had been well underway. It’s time to start that discussion again, Parker said. The downtown library is adjacent to several other projects that will impact its future, including the large underground parking structure – and whatever is eventually chosen to be built on top of it – being constructed immediately to the north of the library. In other business, the board approved a one-year lease extension of the office space that houses the Ann Arbor News archives. The library took possession of the archives in January 2010. AADL is digitizing and posting the archives online, as part of the library’s Old News project. The board also was briefed about an audit for its 2010-2011 fiscal year, which ended June 30. The auditor – Dave Fisher of the accounting firm Rehmann – described it as a clean audit. He suggested that the board consider implementing a fund balance policy in response to a new reporting standard issued by the Governmental Accounting Standards Board (GASB). The board’s finance committee plans to take on that issue. In her director’s report, Parker noted that AADL had again received the Library Journal’s five-star rating. It’s the highest rating awarded to libraries, and AADL was the only library in Michigan to achieve five stars. Later in the meeting, Eli Neiburger – AADL’s associate director of IT and product development – gave a presentation about the library’s popular summer game, which this year had added an online component and achieved an unprecedented level of participation. He noted that although the game is AADL’s version of the traditional summer reading program, the word “reading” isn’t used to promote it. Feedback from previous years indicated that reading seems too much like homework, and discourages participation. ”Take the word reading out of the game, and people will read a lot more,” he said. On the agenda was a resolution to transfer $45,000 out of AADL’s fund balance and into the administration’s consulting budget. AADL director Josie Parker told the board that she’d asked the finance committee to introduce the resolution. She noted that in late 2006, the library had started exploring options for the future of the downtown building on South Fifth Avenue. They had convened focus groups, and hired architects to develop possible plans for the site. It’s now been three years, Parker said, and her administration is recommending that they pick up the discussion again. That effort would include looking at the process for determining how to provide public library services at the downtown location into the future. They’ll need to have some studies done in order to start up that conversation again, both internally and externally, she said. While much of the previous work is still relevant, enough time has passed so that fresh information is needed. By way of background, the downtown library site, at the northeast corner of William and South Fifth, is in an area that’s undergoing transformation in several ways. Directly to the north, a large city-owned underground parking structure is being built, and is expected to be open next year. No decision has been made about what, if anything, will be built on top of that site, but that decision would have a direct impact on the library. Across Fifth Avenue, the Ann Arbor Transportation Authority will be rebuilding its Blake Transit Center, the hub for AATA’s bus routes. Adjacent to BTC, the city-owned surface parking lot at the northwest corner of Fifth and William is one of the sites being analyzed by the Ann Arbor Downtown Development Authority for possible redevelopment. At AADL’s Nov. 22 board meeting, Jan Barney Newman asked Parker if the library will be entertaining bids for this consulting work. That’s not required, Parker said. Depending on the work that she and her staff determine is necessary, they’ll likely ask specific firms to make proposals. Outcome: The board unanimously approved the transfer of $45,000 to the administration’s consulting budget. Added to the agenda at the start of Tuesday’s meeting was a resolution to renew the lease with Green Road Associates for one year, beginning Jan. 1, 2012. The annual rate of $38,000 is unchanged from the library’s current lease at that location, according to AADL director Josie Parker. The location at Plymouth Park – an office park owned by First Martin Corp. off of Green Road, north of Plymouth Road – houses the Ann Arbor News archives. The library took possession of the archives in January 2010, a few months after the newspaper’s owners shut down the business. The library’s two-year lease at that site is coming to a close, Parker said. She noted that a provision in the lease allows either party to end it with six months’ notice. Those terms are acceptable to the library, Parker said, giving them plenty of time to find other space and move, if necessary. Other tenants in the building include companies that are growing and that might need the space to expand, she said. “No one can not want a business in Ann Arbor to expand and grow,” Parker added, in explaining why AADL was willing to accommodate that possibility. Outcome: The board voted unanimously to extend the lease for the Green Road facility. Ken Nieman, AADL associate director of finance, HR and operations, gave a brief financial update to the board. The library ended October with an unrestricted cash balance of $14.7 million, he reported. The four line items that are currently over budget – purchased services, communications, software licenses and postage – are all expected to come back in line later during the fiscal year. Nieman highlighted one item in the report’s listing of assets – $6.8 million in short-term certificates of deposit (CDs). He noted that these are invested through a program managed by the Bank of Ann Arbor, which invests the money in a variety of other financial institutions at $250,000 per institution. That amount – $250,o00 – is the limit that’s insured by the Federal Deposit Insurance Corp. (FDIC), Nieman explained. It’s a strategy to protect the library’s assets, he said. He told the board that he also intends to lower the amount kept in savings, currently at $2.8 million. Dave Fisher of the accounting firm Rehmann gave the AADL board an overview of their audit for the fiscal year that ended June 30, 2011. Later in the meeting, Dave Fisher of the accounting firm Rehmann gave a report on the audit that the firm conducted on financial statements for AADL’s 2010-11 fiscal year, which ended June 30, 2011. He noted that he and Sherry Brubaker of Rehmann’s Ann Arbor office had met with the AADL board’s finance committee on Oct. 31 and gone over the audit in more detail. The audit gives a clean opinion of AADL’s financial statements, Fisher said. The audit also looked at AADL’s internal controls for systems like payroll and cash receipts. Out of the library’s $7.5 million fund balance, $7.2 million of that is unassigned. If you divide that amount by AADL’s $12 million in annual expenditures, you’ll see that the $7.2 million equates to about 60% of expenditures – representing about 7 months of operating expenses, he said. “That is very good,” he said. Total expenditures for the year were $12.034 million, with revenues of $12.249 million. That left a surplus of $214,746 for the year. Property tax revenues of $11.163 million accounted for about 91% of total revenues for the year, Fisher noted. Fisher pointed out that three line items relating to personnel – salaries and wages ($5.669 million), employee benefits ($1.545 million) and employment taxes ($426,729) – account for 63.9% of total expenditures. That’s in the same range as other libraries audited by Rehmann, he said. The library wasn’t required to make any adjusting entries, Fisher said, and its books are in good shape. Fisher highlighted two additional issues for the board. As he had during his November 2010 audit report, Fisher noted that it’s important for the library to continue to monitor its compliance with IRS rules related to independent contractors, and to obtain W-9 forms when required. In the past, the IRS left nonprofits and government entities alone, he said, but the agency has started to audit and levy significant penalties in this area. He also suggested that the board consider implementing a fund balance policy. This is in response to a new reporting standard issued by the Governmental Accounting Standards Board (GASB) – Statement No. 54. The new standard makes significant changes to the reporting of fund balances and to the financial statement classification of funds. Fisher said he’d discussed this issue with the board’s finance committee, and had sent Nieman some samples of possible policies the board could adopt. There were no questions from board members regarding the audit. Earlier in the meeting, during her report from the finance committee, Nancy Kaplan had said the committee will be taking up the issue of developing a fund balance policy. She praised Nieman, thanking him for excellent management of the library’s investments and for controlling AADL’s exposure to risk. Jan Barney Newman said that after working with Rehmann for several years, the library staff could anticipate what the auditors would require and she hoped that made the library easier to audit. Board president Margaret Leary expressed pleasure and pride to Nieman and Parker for the outcome of the library’s audit. Outcome: The board voted unanimously to accept the audit report for fiscal 2010-11. Josie Parker, AADL’s director, reported that the library has received the Library Journal’s five-star rating again this year. Based on 2009 data, the Library Journal 2011 America’s Star Libraries recognized 262 public libraries this year out of 7,513 that were reviewed. It’s the fourth time that AADL has received five stars, the highest possible rating. In its category – libraries with budgets between $10 million to $29.99 million – AADL ranked fourth out of 10 libraries, and was the only Michigan library to achieve five stars. Parker said she wanted to recognize two other Michigan libraries that were ranked: Kent District Library in Comstock, and Benzie Shores District Library in Frankfort. Both received a three-star rating. Last year, Kent had also been rated at five stars, but they had decided to leave a co-op program and their circulation dropped. It was a wise financial decision for them, she said, but because of the data used to evaluate libraries in this rating system, it hurt them in the ratings. This system looks at how a library is used, not what it spends money on, Parker noted. It’s also important to understand how policies impact the way that people use the library, and how data is recorded. AADL has a high circulation per capita – 58.9, the highest by far of any other five-star library (the next highest is 32.3). But AADL’s public Internet terminal use per capita, at 1.7, is tied with another library as the lowest in that category. Parker explained that many other libraries require users to log off every hour. If no one else is waiting to use the terminal, that person can log back on again. But each time, it counts in the library’s statistics as another user. In contrast, at AADL someone can stay on the computer as long as they want, if no one else is in line to use it. So even though in each instance one person is using the computer for the same amount of time, it would result in different statistics, depending on the policy. Parker also noted that she had attended the Friends of the Ann Arbor District Library meeting earlier this month. FAADL has received its fourth consecutive audit without any concerns or the need to make modifications, “which was a great moment for them,” she said. Parker said she wanted to publicly acknowledge FAADL’s hard work, and noted that Sally Allen has served as treasurer for that entire four-year period and has done a magnificent job. Allen is now stepping down from that role, Parker said. By way of background, FAADL operates a bookstore in the lower level of the downtown library, and gives proceeds to the library. In 2006, the shop was temporarily closed when it was discovered that the group had lost its nonprofit status in 2003 and hadn’t been audited in several years. According to an Ann Arbor News report at the time, there was no indication that the 53-year-old organization had misspent money or mismanaged its finances. 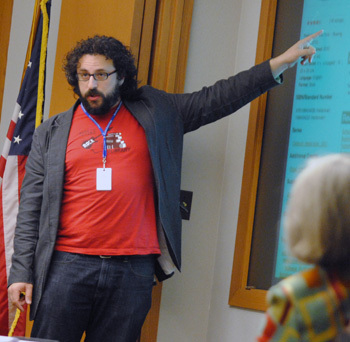 At the board’s June 2011 meeting, Eli Neiburger – AADL’s associate director of IT and product development – had given a brief presentation on the library’s new online component of its standard summer reading program, which the library has set up as a game. On Nov. 22, Neiburger gave an update on the outcome of the summer game, noting one key to its success: Reading is never mentioned in the program’s description. Neiburger told the board that the summer game had an unprecedented level of participation, and a huge growth in adult participation. You could play by texting, in paper format, or online, he noted, and there was a great deal of overlap in modes of participation. Just over 1,000 people played online only, while nearly 7,000 people registered for the print version of the game. But there was an overlap of nearly 4,200 people who played both in print and online. Neiburger said he suspects that reflects how patrons use the library, too – although the amount of overlap would be even greater. The game provided a variety of ways to earn points by completing tasks like checking out a book or other item (10 points), tagging an item in the AADL catalog (10 points), downloading music (10 points per track), writing reviews (200 points), or posting a comment (50 points). Between 200-500 points were awarded each time you attended an AADL event, where a code was announced that allowed you to redeem the points. Codes were also tied to locations within library branches, or to finding answers by searching the AADL website. One point was awarded per page or per minute spent with media – either an item from the library, or from another source. You also got 100 points for completing a book or other item. Neiburger noted that nearly 8 million points were recorded in this category for books. A total of 11,217,459 media points were awarded during the summer game, including almost 9 million points related to print. That shows this community still loves to read print in a big way, he said. Some students reported that searching for information to get the AA Streets Sweeper badges brought them to downtown Ann Arbor for the first time ever, Neiburger said. In total, 155 different badges were available to earn, and 32,201 badges were awarded – about half of them to adults. The points could be exchanged for items at the AADL summer game shop, like T-shirts, caps or totebags. Neiburger also noted that the library took the word “reading” out of the game. The feedback they’d received in previous years was that reading seemed too much like homework. By making it open-ended, with an unlimited amount of points for a variety of tasks – all involving literacy skills – it became more popular. “Take the word reading out of the game, and people will read a lot more,” he said. Throughout the game, the AADL posted a leaderboard showing point rankings for the top players. Neiburger said that one of the leaders in the top 20 for the entire game was a six-year-old boy. It’s a way for kids to see success in a way that’s not always possible in school, where recognition is more often given for athletic ability in sports. In terms of logistics for operating the game, the only thing that was harder about this summer compared to previous years, Neiburger said, was order fulfillment of prizes that were redeemed with points. To handle that, once a week teen volunteers came to the library and filled orders, getting 200 points for each order they filled. Prizes could be picked up at any branch – the process mirrored the service of reserving a book online and picking it up at the branch most convenient for the patron. Many people hadn’t used this service before, Neiburger said, so picking up their prizes introduced them to it. The library filled about 2,700 orders during the summer game, and awarded 4,685 prizes – just for the online portion of the game. The game also significantly increased site traffic to AADL’s website, as measured by page views – up 124% in July compared to last year, and up 139% in August. And even though the traffic has slowed since the game ended, it was still 49% higher in September compared to 2010. As the game came to a close in August, Neiburger said the staff started hearing something they hadn’t heard before – people didn’t want it to end. 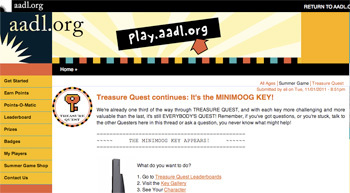 So there are now two games that are ongoing: (1) Points-O-Matic Click-a-Tron, where people can earn points for selecting the best reviews of items in AADL’s catalog, indicating whether a review is helpful, or tagging a photo; and (2) Treasure Quest, a complex game that involves following clues to find keys that unlock “gates” hidden online. Over 200,000 points have been awarded in these two games so far, Neiburger noted, even though the library hasn’t said anything about awarding prizes for these points. In response to a board member’s question about whether other library systems are doing this kind of thing, Neiburger said he’s not aware of anything quite like AADL’s game. The software was written by AADL staff using open source code that’s available to any library “that has the chops for it,” he said. Parker added that AADL can’t provide the staff support to other libraries, but if other libraries have the expertise on staff, they can replicate the program using AADL’s code. Several board members congratulated Neiburger and AADL staff for the work. Jan Barney Newman, who founded an educational game company called Aristoplay, said the point of games she designed was to learn, which is the point of the AADL’s games too. She said she hadn’t been a player this year, but planned to do it next summer. At the end of the meeting, the board intended to vote on setting a closed session for its Dec. 15 meeting for the purpose of discussing labor negotiations and the written opinion of its legal counsel. 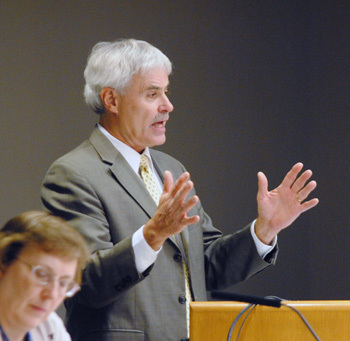 Before the vote, however, AADL director Josie Parker noted that because a vote to discuss the opinion of legal counsel required a two-thirds majority of board members – and because only four of the board’s seven members were present – they could not authorize that purpose for going into a closed session, under the state’s Open Meetings Act. The vote for labor negotiations required only a simple majority. Outcome: The board unanimously voted to set a closed session on Dec. 15 for the purpose of discussing labor negotiations. Present: Rebecca Head, Nancy Kaplan, Margaret Leary, Jan Barney Newman. Also AADL director Josie Parker. Absent: Barbara Murphy, Prue Rosenthal, Ed Surovell. Next meeting: Thursday, Dec. 15, 2011 at 7 p.m. in the library’s fourth floor meeting room, 343 S. Fifth Ave. [confirm date] Update: At a special meeting held on Dec. 8, the AADL board cancelled its Dec. 15 meeting. The board’s next meeting is on Monday, Jan. 16, 2012. 1) Did Ms. Parker suggest that economic conditions are now much better than they were three years ago? Possibly I missed discussion of this in the article. Was there some other explanation for why Now is the right time? 2) The AADL Board was to go into closed session to review a “…written decision of its legal counsel”? WOW! Didn’t know that written decisions of legal counsel could HAPPEN on 5th Street. Any chance of that idea migrating a few blocks north, or does the One Way south-bound nature of the street prevent ideas from moving north? Or does the parking garage construction project blocks ideas? Perhaps enhanced AATA service could help that idea to circulate. If it did, public art could memorialize it, and Congressman Dingle could order a TIGER III grant to pay for the art (as long as the grant wasn’t timed to influence elections). The Open Meetings Act requirement for a two-thirds vote to go into closed session to discuss a written opinion of legal counsel is news to me. Dave, could you please provide a link to this provision of the OMA? Sec. 7. (1) A 2/3 roll call vote of members elected or appointed and serving is required to call a closed session, except for the closed sessions permitted under section 8(a), (b), (c), (g), (i), and (j). The roll call vote and the purpose or purposes for calling the closed session shall be entered into the minutes of the meeting at which the vote is taken. The reasons in 8(a), (b), (c), (g), (i), and (j) that escape the 2/3 vote requirement [in very abbreviated form] are: (a) personnel matter (b) student discipline matter (c) labor negotiation strategy (g) partisan caucus of state legislature (i) conference under public health code (j) job search for president of a university. Her remarks were relatively brief, and there was not a detailed discussion about why now is a better time than three years ago. It’s possible that she went into that level of detail with the finance committee – that’s a meeting I didn’t attend. Its members are Barbara Murphy (chair), Nancy Kaplan, and Ed Surovell. 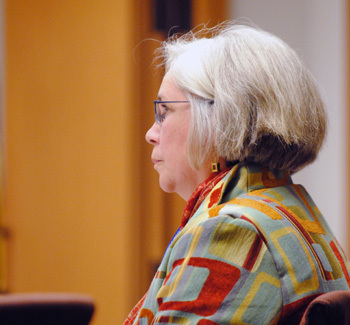 Of the three, only Nancy Kaplan attended the Nov. 22 board meeting. I know that 3 years ago the library couldn’t have floated a bond; I think that market is a bit more fluid than it was 3 years ago and that’s pretty important for an expensive undertaking. However, the citizens of Ann Arbor (and even moreso for the US in general) are much less likely to support spending on anything, so getting a majority of voters to support the committee’s recommendations may be difficult. After all, isn’t Amazon loaning books out now? Some may think there is no need for a new library, especially downtown where (a) folks have issues with paid parking; (b) where some portion of the patrons will be using the facility as a warming shelter. I do not understand why there is a balance of 14.7 million dollars? Why is it so big? Is the AADL having huge operating profits? Do they have any big obligations coming due? Can anyone explain why the AADL has so much cash? Kerry D., I was on the Library Board from 2000-2008. As I recall, the property tax revenues are received in one big lump, which then funds the Library for a year. As the article says, the surplus for the most recent fiscal year is only a bit above $200,000. When will the insanity cease? It makes NO SENSE to demolish the existing building only to erect new brick and mortar in its place. The downtown library is a fine building with strong bones and a unique character. I proudly bring out-of-town guests into the building to see its fabulous stairway and the gorgeous two-story skylight-capped space between the third and fourth floors. At almost 110,000 square feet of serviceable area, it is a travesty to even think of losing this building. And please, let’s take any consultant’s opinion with a grain of salt. It’s easy (and safe) to start over — true creativity and responsibility will come only from working with the existing structure. I agree with M.C. Zacharias regarding the present building, which I favor being rehabilitated. An interesting factoid relating to #10: I believe that the current main building is on property that really belongs to the Ann Arbor Public Schools (a legacy of the time when the library was part of the school district). As I understand, if they give up that space, they lose it, which would mean that they’d have to pay to acquire a new spot, especially one in the heart of Ann Arbor’s State Street commercial district (where parking is problematical). I’d hate to see that happen also because the Library is serving as an anchor for the William St. axis in that part of town. I hope and assume we’re past the point where the Library Board tried to justify a new building just because the old one is “old.” Or because of maintenance costs, when those costs are far below the cost of a new building. The library decided to take the word “reading” out of the summer game, but also wants us to come along for a $50 million ride on the traditional book warehouse express?